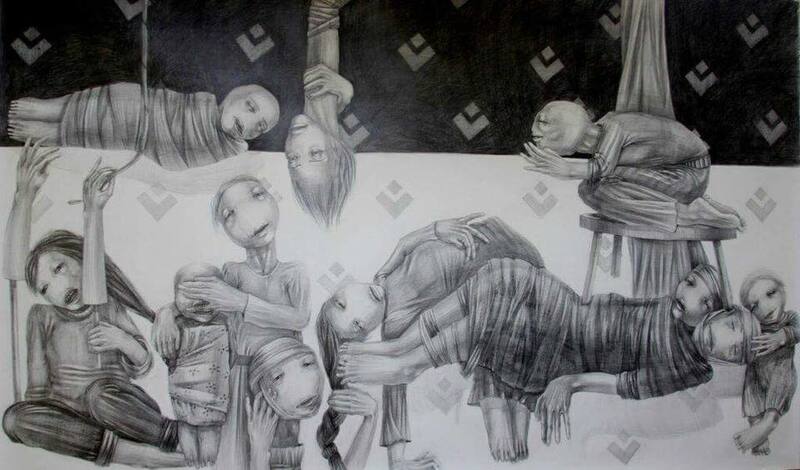 ‘Ghouta,’ painted by Randa Maddah. Used with permission. Source: Women Now. The Eastern Ghouta suburb of Damascus has been a scene of intense suffering throughout the seven-year-long war in Syria. It is the harshest and longest-sustained example of the regime’s “starve or surrender” strategy as well as the target of several chemical attacks. Ghouta has been besieged since late 2012, when President Bashar al-Assad's forces lost control over the area to opposition groups. In 2013, the regime tightened the siege, preventing food and medical supplies from entering. On February 18, 2018, Syrian government forces, the Russian air force and allied militias started a fierce offensive to retake the area. Several weeks later, Ghouta fell. Ordinary people have borne the brunt of the bombardment: The Violations Documentation Center (VDC) for Syria told Global Voices that, as of April 16, 2018, it had documented 2,165 deaths, of whom only 201 were non-civilians. And as of March 8, 2018, 30 medical facilities had been bombed, nine of which were rendered out of service, according to the VDC. 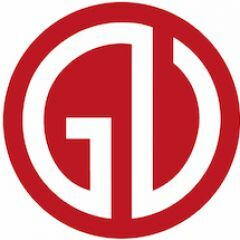 Below is a selection of Global Voices’ stories on the years-long plight of Ghouta's residents. 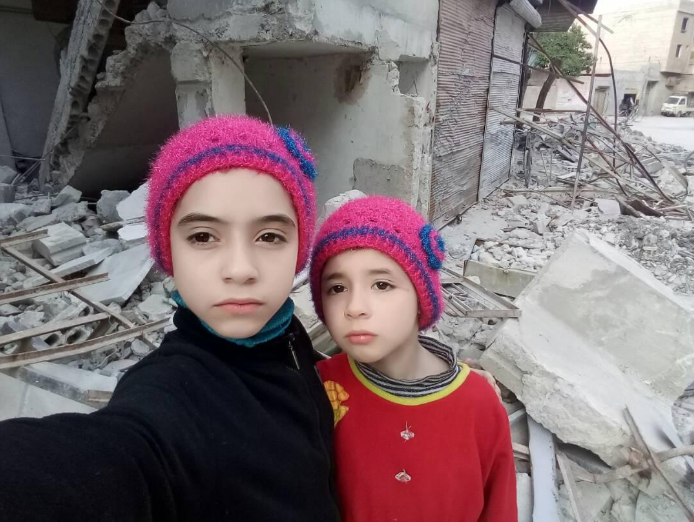 Under these desperate circumstances, even children became war reporters, as Mazen Hassoun reported for Global Voices on March 19, 2018. Hassoun spoke with 12-year-old Noor Al-Khateeb, who alongside her sister 8-year-old Alaa has taken to Twitter in a joint account to speak for themselves about the ongoing siege. Noor and Alaa filming the destruction caused by Syrian regime air strikes in Eastern Ghouta. Used with permission. Prices peaked as a consequence of the siege. Although the region is primarily an agricultural area, so some people were able to harvest some seeds and feed themselves, hunger was widespread. Graphic photos of children starving to death caused regular public outcry that went mostly unanswered. In an effort to better the situation, one local NGO cultivated mushrooms and distributed them for free, as well as taught families to grow their own, as Joey Ayoub and Mustapha Itani reported for Global Voices on September 2, 2017. One of the organizers, Dr. Ahmed Leila, told Global Voices that they started by “producing seeds from mushrooms that grow naturally in the region” before examining them and assessing their quality and suitability to be consumed. They then built a small mushroom farm in a tub, and when this worked, they moved on to a bigger tub, and so on. Now, they have “designed an educational farm for the region”. Medical supplies quickly ran out in besieged Ghouta, and in late 2017, the area was again in the media spotlight because of the degrading medical conditions. United Nations experts called for patients with the most severe cases of illness to be evacuated to Damascus where they could be treated, as well as aid for those whose medication was no longer available. In an article published in Global Voices in January 2018, Firas Abdullah, a Syrian freelance photojournalist who had been based in Douma until his forced displacement by regime forces, described the dire conditions in which cancer patients were treated in Dar al-Rahmah Medical Center, the only center specializing in the treatment of tumors in Eastern Ghouta. Dar Al-Rahma Center for Cancer in Eastern Ghouta. Photo taken by the media officer of the center and republished with permission. “[At] the [beginning] of 2017, the siege [tightened] … so the huge number of patients leads to drain treatment and [a shortage] of many medications. Now what we have in our hands serves only 3% of patients,” reported Dr. Mohammad, who works at Dar al-Rahmah. Yaser Al-Shami, the administrative officer, explained that the center could not to conduct all aspects of cancer treatment, since post-surgery and radial therapy materials were no longer available in Ghouta. In January 2018, about a month before the beginning of the latest military offensive, shelling began to intensify in Ghouta. People went underground and started to spend most of their time in overcrowded shelters. Bereen Hassoun, a nurse and a mother, gave a harrowing account to the Act for Ghouta collective of her everyday life in these conditions. 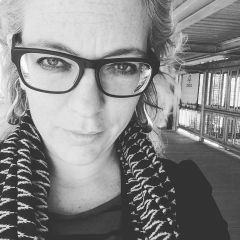 Global Voices published her testimony on February 20, 2018. She described how people suffered from the cold and had little access to the most basic amenities. Diseases circulated easily between the children due to the unsanitary living conditions. 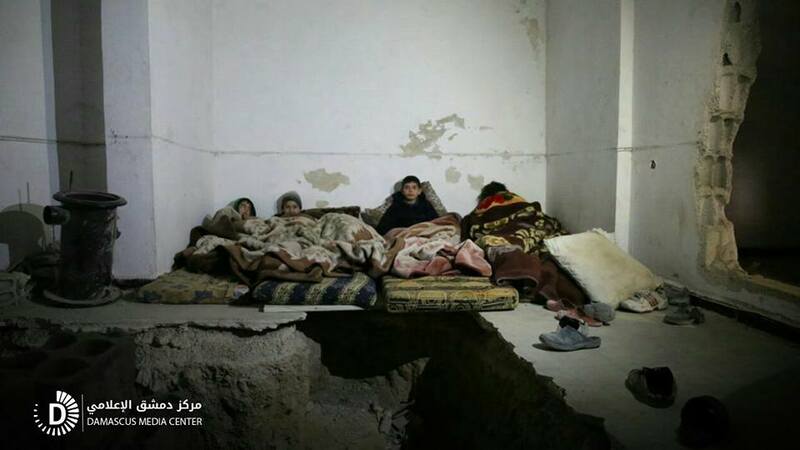 Children hiding from shelling in Harasta, Eastern Ghouta. 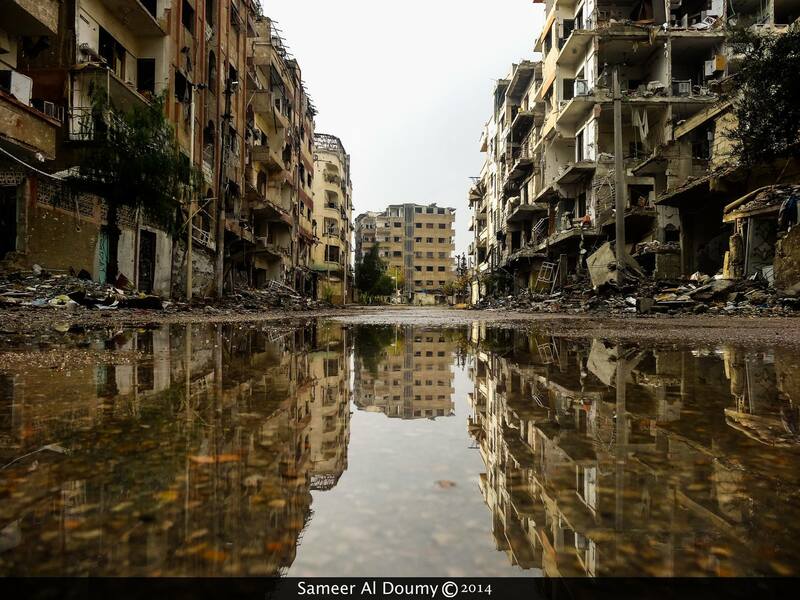 Photo by Mohammed Rabee for the Damascus Media Center, used with permission. On February 24, the UN Security Council adopted resolution 2401 that demanded a 30-day ceasefire that would enable the sustained delivery of humanitarian aid and the evacuation of the critically sick and wounded. However, the VDC noted no significant reduction in violence. On February 27, 2018, Russia unilaterally announced a five-hour daily truce that would allow for the establishment of humanitarian corridors. Photo by Samir Al Doumy. Used with permission. Source. Showing signs of solidarity with Ghouta from elsewhere in Syria has been dangerous. While the majority of people in Damascus remained silent, whether out of fear or conviction, there are those who denounced the offensive on Ghouta anonymously. The Syrian regime and its Russian ally have taken over Ghouta. As has happened throughout the war, the use of several unlawful weapons against Ghouta has been reported, including that of chlorine, barrel bombs, cluster bombs and incendiary weapons. 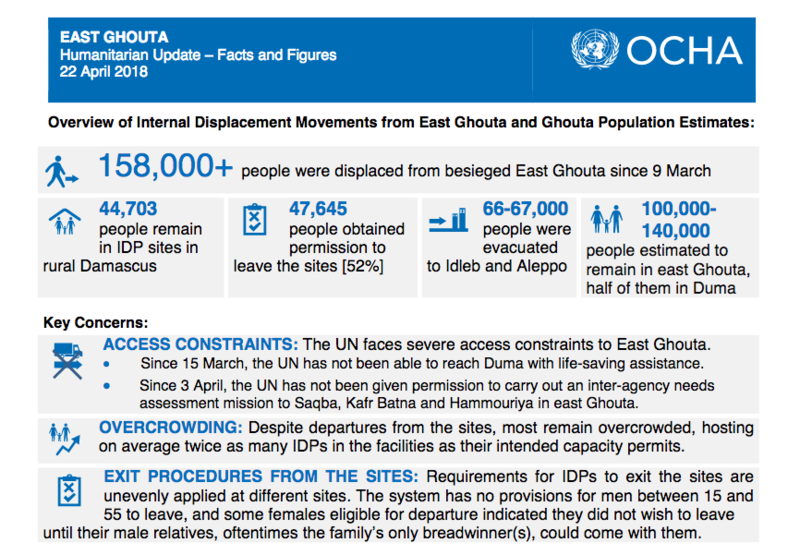 Screenshot of latest facts and figures on East Ghouta by the UN at the time of writing. Source: ReliefWeb. Regime forces appear to be not just out to conquer, but to also destroy. With such an aim, the people of Ghouta will most likely continue to suffer. This page was written by Leila Sibai.